LEAD’s senior economist was recently interviewed in an episode of UNC-TV’s ncIMPACT program covering women in the construction trades. In case you missed it, you can stream the episode here and find an extended version of the interview here. The episode airs again on Thursday, February 7, at 8pm, on UNC-TV. Here are two key things you need to know about construction jobs and women in North Carolina’s workforce. Construction sector employers have struggled to fill open positions during the past several years. 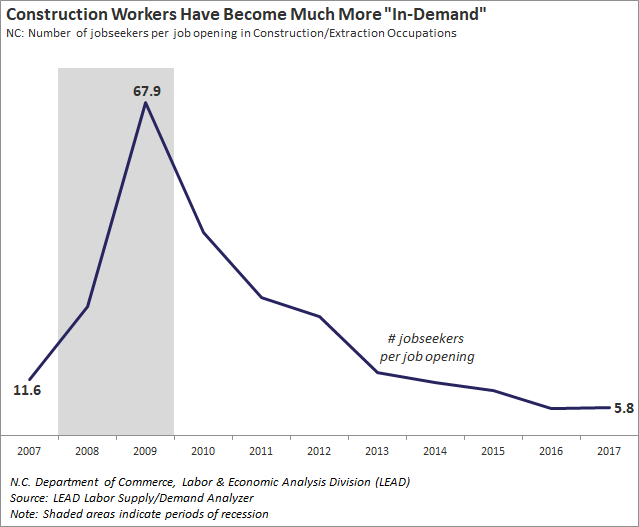 The market for construction workers has tightened considerably—there has been a rapid expansion of job openings, but a decline over time in the number of jobseekers. In 2017, there were only 5.8 jobseekers per job opening in the construction field—half as many as there were prior to the recession in 2007, and fewer than one-tenth as many as during the height of the recession in 2009. Why is it so much harder to find construction workers these days? The roots of this problem can be traced, in part, to the Great Recession. One-third of all jobs in our state’s Construction sector were eliminated during the recession, and Census Bureau researchers have found that, at the national level, around 60% of Construction industry workers who lost their job during the recession switched to a different industry or left the workforce entirely. Women have historically represented a small minority of workers in the construction field. In 2017, only 4% of North Carolina’s construction workers were female. However, high rates of gender segregation are not limited to construction. 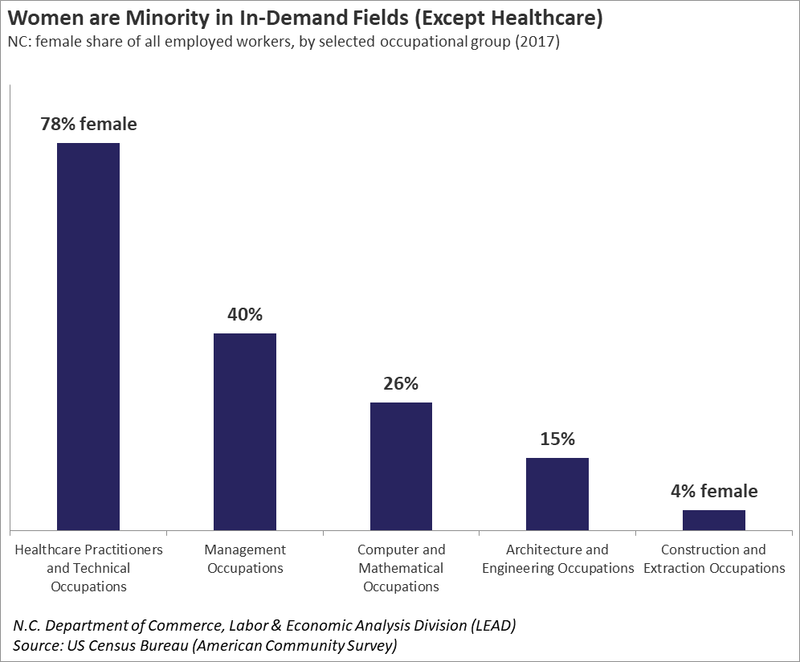 In fact, among our highest-paying, most in-demand occupations, only in healthcare do women predominate. Other fields—including management, architecture and engineering, and computer and mathematical occupations—are dominated by men. In case you missed it, the episode airs again on Thursday, February 7, at 8pm, on UNC-TV. You can also stream the episode here and find an extended version of the interview here. Data sources cited in this article are derived from surveys and/or administrative records and are subject to sampling and/or non-sampling error. Any mistakes in data management, analysis, or presentation are the author’s.